UP TO MARK: Tougher planks were used to re-build the walkways to make them safer. CHILDREN can once again swing high up into the sky. A new community hall has been built. The school and mosque have fresh coats of paint. And new walkways link the stilt houses. These are among the projects recently completed by Operasi Raleigh Bertam '98, a joint effort by Raleigh International (Singapore) and the Indonesian Red Cross Society in Batam. Two batches of about 100 people each, aged 17 to 30, spent a week on the island, staying in tents. HOPE SPRINGS ETERNAL: A child from the village bathing herself at the spring bath that was rebuilt with the help of the Operation Raleigh team. Pulau Bertam, only about the size of Sentosa, is 4 km south-west of Batam. It had been turned into a resettlement village for Orang Laut (sea gypsies) 12 years ago. The chief of the fishermen, Mr Mahadan, 54, said the island's 26 families could not afford to do much as they are quite poor. 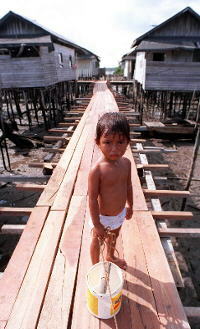 Mr Mahadan lives in a stilt house with his mother, wife, five children and two grandchildren. BRIGHT AND EARLY: Robi Mahadan, nine, having lessons in a classroom which has had fresh coats of paint applied by the volunteers. Like other families on the island, Mr Mahadan and his family depend on fishing for their livelihood. He goes to sea at 5 pm and returns around midnight. The villagers have no electricity, no clean drinking water or proper sanitation. They just jump into the sea to bathe. The wooden planks making up the walkways that link the stilt houses had rotted over the years. Some collapsed. Some villagers even had to abandon house. The community hall had been destroyed in a storm. But with the help of the Raleigh team, the hall was rebuilt. Safer walkways were also built using tough wooden planks. Some volunteers were doctors. In their two weeks on the island, they ran a temporary clinic for the villagers. CENTENARIAN:Village chief Mr Mahadan's mother, Madam Penoh, 107, receiving medical attention from a doctor volunteer. "It is a great accomplishment for the volunteers of Operasi Raleigh Bertam, especially when they see villagers making use of the re-built facilities, like going to the re-constructed spring to collect water and bathe,'' said expedition leader Dr Eric Tan Sohn Joo, 30. The villagers are so happy with the difference that they hope to get help to build new houses and more cement paths. Singapore Press Holdings. All Rights Reserved.